My multi-month world trip with my wife (who is Austrian – nationality rather than economic school of thought) and 2 kids (who are 6 and 10) begins on Tuesday, starting with a week in Singapore, adopted home of Jim Rogers. He has said that a smart man would have moved to London at the start of the 1800s, to New York at the start of the 1900s and to Asia in the early 2000s, anticipating Asia to be the economic power of this century. He believes today’s Asian work ethic is the same as the USA used to have. I hope to get a feel for that myself. After Singapore we travel by land into Malaysia, and from there into Thailand. We intend to visit quite a few countries around the world, so if I am coming to your neck of the woods, and you have a few tips on what to do, what to see, where to eat or where to stay, let me know. John (at) solarcycles (dot) net. I will keep you updated of our route. My posting times will change, due to the time difference. Also I may not be able to achieve the same depth or frequency. But over this important time (when it is ever not?) I will absolutely still be sharing my thoughts and actions, and looking for your continued input. OK, to the markets. This week’s data looks like this. US earnings are now overall slightly negative year on year but slightly above pre-season expectations (which was for worse). US economic was data overall mixed, but Economic Surprises are still strong (now standing at +51.7). Conference Board global leading indicator data has generally disappointed for this month. Australia -0.8 (last month zero), Eurozone -0.4 (last month +0.5), China +0.3 (last month +0.7). 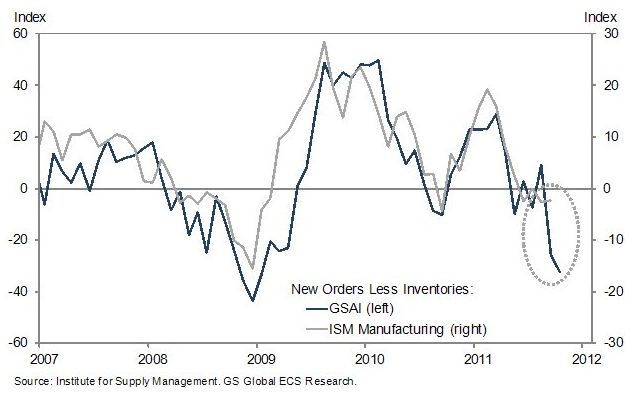 That data is a warning flag because the global improvement seen in September over August may be being reversed. 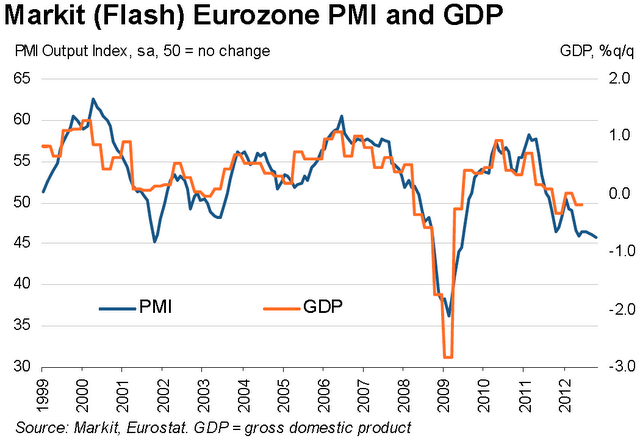 Eurozone PMI came in lower than expectations and sets the scene for a negative GDP reading. After this coming Monday’s full moon the pressure should change to positive, coinciding with positive seasonality into and around the US election. Again, as per my last post, I will be looking for an up move with negative divergences (in economic data and technicals) for evidence a cyclical equities topping has begun (and to sell into the up move), or for positive developments to accompany the up move and to suggest that the sell-off we have seen was rather a post QE announcement normal pullback based on unimpressive earnings. Tom Demark believes the Nasdaq has made its price peak already and the counter rally due will therefore fall short, whereas he believes the SP500 will make a marginal new high, before both then retreat 12-17%. The Hang Seng has held up relatively well during this last 2 weeks and has maintained its long term triangle breakout. Treasury yields have also performed bullishly. Gold sentiment has pulled back sufficiently to enable a renewed move higher, and the 1700 level that it has currently reached represents a 38 fib retracement of the recent up move. 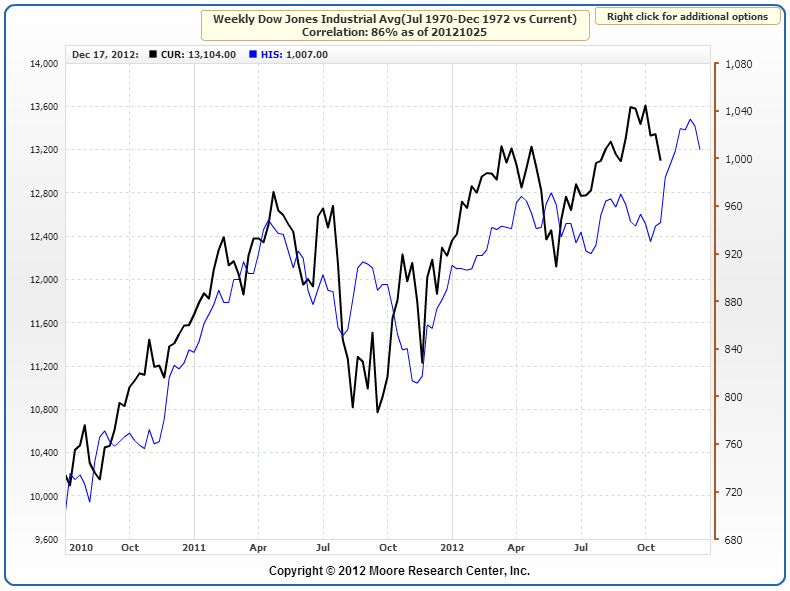 Below is my recent prediction for stocks and commodities into 2013. Now if stocks top out lower than 1600 on the SP500 and have begun their topping process already then that is still consistent with historic mirrors (only the peak price level would change), as long as commodities now go on to outperform and make their blow off secular top. The rise in treasury yields despite the pull back in pro-risk is a positive for this scenario because by history yields need to rise as money flows out of safe havens into pro-risk, and if equities are stalling then commodities should be the recipient. The current threat to this scenario is the renewed weakness in global data (leading / concurrent). I maintain there needs to be sufficient health in the global economy into 2013 to enable a broad secular commodities blow-off top. Gold could potentially go its own way – operating as a hard currency and safety asset – but right now it isn’t showing any outperformance. And one last thought – if a renewed global turndown did gather pace right ahead, then might the Fed step in once again, this time with one of its as-yet-unused unorthodox policy tools, which could then inspire a mania into hard assets if desperation was perceived? It may not work again but could provide a tipping point into hard assets. Well, that’s just speculation. We will see how things develop. 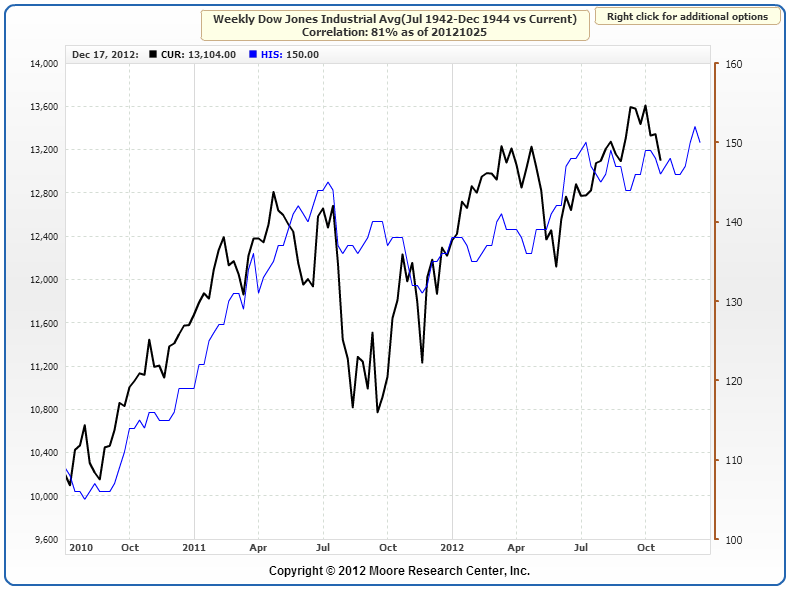 Any cyclical stocks top should be a drawn out rounded affair so there is no rush to action. And the leading commodity in this secular commodities bull, gold, is in a bullish technical position, having broken upwards out of its 11 month consolidation. Collectively, when stocks and commodities make their next up trend move – whether that be counter or renewed trend – more evidence will come to light. Both have chart correlation percentages over 80%, both 1944 and 1972 were US election years and both fell within secular stocks bear / secular commodities bull periods, and the combined prediction would be for an up move next into and around the US elections, which is consistent with expectations further up the page. No guarantees of course – just a guide. Lastly today, price to book ratio. Price to book ratio (p/b) is an alternative valuation measure for stocks to price/earnings. A p/b ratio of 1 is the theoretical liquidation value of a company or stock index, i.e. assets minus liabilities. Buying a stock at a p/b sub 1 is either getting a bargain or there is something wrong with the company. Shown below is the p/b ratio for US and Europe indices since 1975 to current. The best time to buy a porfolio of the two would have been 1981/2 when they both dipped under p/b 1. The cheapest stock indices valuations globally that have ever been witnessed were in Thailand at the time of the Asian Financial crisis (late 1990s) and Greece in the Euro debt crisis of current times. Greece hit a price/earnings valuation of sub 2 at its lowest whilst the Thai SET reached a p/e of 3. Here is the Thai SET long term p/e valuation chart, showing a double dip to around 3 in that crisis period. The Thai SET is currently 4 times higher now than then, so buying Thai stocks when the p/e was 3 would have been a good investment. We can also see the p/b ratio hit its lowest around then also, to around 0.6, which again would have been a great entry point, with markets overly discounting bad scenarios. 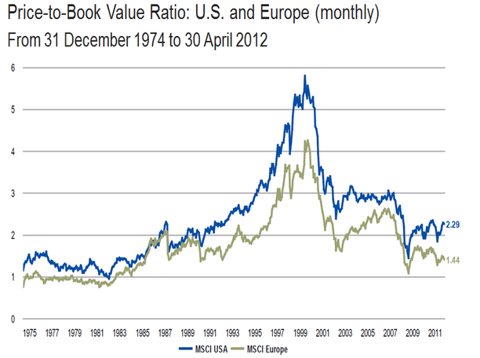 A snapshot of global stock indices p/b valuations in 2011 looked like this. Greece was the cheapest on a p/b of 0.76. The great majority of other countries, ranging from G10 to developing nations ranged from a p/b of over 1 to sub 3, with a few rogue outsiders more expensive than p/b 3. There is no question in my mind that the Greek stock index will return handsomely in the long term for those brave enough to have ventured in at its lows this year and last (it has currently doubled off its lows). The risk is that it tanks again, once or more, before rallying in earnest, subject to developments in Europe and the wider world. Now that is has doubled, its valuation by p/e or p/b is no longer cheap but mid-range globally. But, like the Thai SET in the late 1990s, the point is to buy in at a p/b some way below 1 and be patient. So, it is interesting to see Japanese stocks at a p/b ratio of just 0.77. 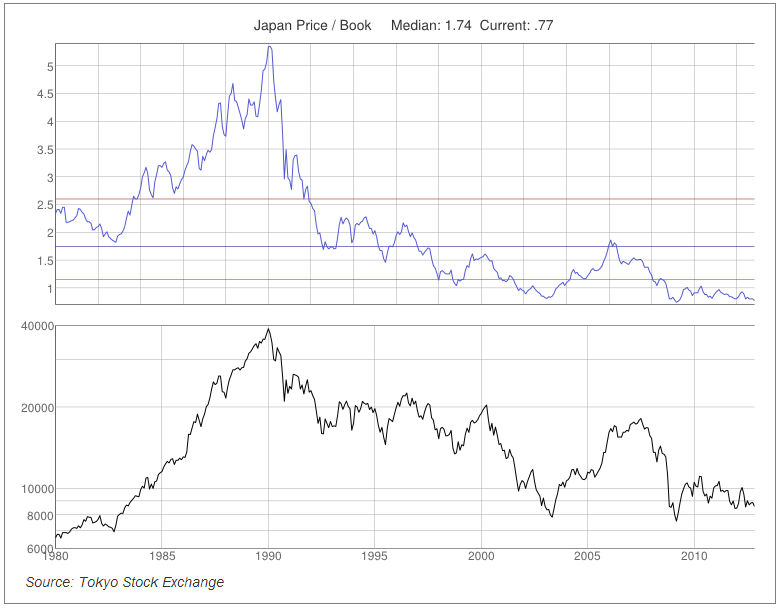 Whilst price/earnings valuations haven’t dropped so extreme low (13.7 Nikkei, 10.9 Topix currently), the price/book ratio reveals a much more compelling undervaluation, suggesting the liquidation of all Japanese companies in the Nikkei would actually return almost 25% more cash than it costs to buy them currently. Since the 1989 Nikkei peak, the index has gradually been making what appears to be a rounded bottom. Recall the 19 year cycle showing up in the Dow Jones stock index spectrogram? 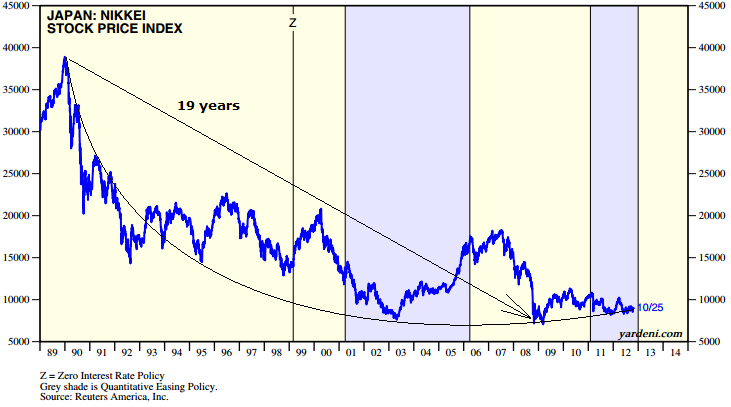 Well, from the Nikkei peak to the nominal low to date was 19 years. Just speculation that it may have relevance here, but if the rounded bottom continues its trajectory then that nominal low of Oct 2008 should hold. In support of that price bottom holding, the price to book ratio of 0.77 is historically extreme. It is in the same zone as the Thai SET at the worst of the Asian financial crisis and as Greece in the Euro debt crisis accuteness. It is also little higher than that reached at the Nikkei’s nominal Oct 2008 bottom. So are the Japanese stock indices a great buy and hold opportunity here? To answer that we have to consider its debt and deflation problem that has plagued it throughout its decline since 1989. It has the highest debt to GDP ratio in the world. However, unlike other indebted countries most of this debt is held domestically, by the Japanese people. This makes Japan less likely to be a default candidate, particularly given the Japanese culture. However, it has to keep rates low to service the debt and pursues inflationary policies which would help shrink the debt. Until now though it has failed to re-ignite inflation despite its policies. It is heading for one of two outcomes: debt default – which I believe is unlikely (at least in this decade) – or inflation finally takes hold and yen-weakening becomes the trend. Given the yen has been in a 30 year bull market since the early 1980s making for extreme relative historic valuation to other currencies, and real estate prices have dropped to 36% below long term averages in terms of both versus rent and versus income, and equities have reached extreme historic p/b cheapness valuation, I believe there is a strong possibility that money now starts to pour into the inflationary assets or equities and real estate (over months and years). So what about the p/e valuations not having reached sub 10? Well, that is a thorn in the side of the undervaluation story, however, Japanese p/es average higher historically than other countries. Nikkei and Topix p/es are actually lower now than they were at the bottom of the 1970s secular bear. On p/e alone I would not be a buyer but it is the p/b valuation that really shows the current value on offer. If further casts doubt on a deep stocks bear ahead – at least in that part of the world, with also Chinese equities on a p/e of just 7.9 paying dividend yields of 3.8. In terms of Japanese equities I believe it is more likely they can further their rounded bottom. The historic extreme undervaluation for real estate and historic extreme overvaluation for the Yen is also supportive of a wider risk/safety inflation/deflation asset reversal. I maintain we are in the transition years from global secular stocks bear to global secular stocks bull and K-winter to K-spring, and that this is also supportive. My average Nikkei long position is 8481 (current price 8913). I have added to that this morning with a view to a longer term hold based on the above. 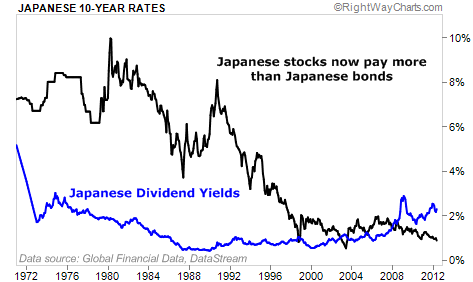 Edit: One more chart to add that I missed off: Japanese equities now yielding more than Japanese bonds, adding to their relative attractiveness. Nice trip, John. Asia is the present and the future. By the way, how you manage with your child´s school to stay a long time out of classrooms? Thanks Antonio. They have had to officially leave school. The plan is for my wife to give them some home schooling whilst I spend a little time looking at the markets. Are you allow to do it at home? I know some cases in Spain, but i´m not sure if iis still legal here. Nice. Now that’s one thing I will agree with you on all day my friend!! Have a wonderful trip, John, full of adventure and fun surprises! Are you considering moving to that part of the world permanently? Climate is nice (that is, if you like warm). Thanks Greg. Going into the trip open minded. It will certainly put the UK into clearer perspective. As always: Many thanks for your update, John. Much appreciated. If you look at the $SPX at its two peaks and divided it by the 10 year US note yield, you would find that in 2000, that ratio was around 270.50. In 2007, it was around 370, and today the ratio is at 79, down from its recent highs of 950. The reason I bring this up is because we have always been told that stock prices and bond prices (not yields) move in the opposite direction. A longer term chart shows this is simply not true at all. Since 1980, the ratio of the S&P 500 price by the $TNX index (10y note yield multiplied by 10) has risen by an astounding 8,000% percent. If we compare this to the NASDAQ from 1985 to its peak in 2000, that $NDX rose 3,700%. Now, due to the factor that we divide the yield by the stock price would lead you to believe that in order to get back to the trend line or the mean, the easiest way to go about it would be for the yield to rise faster than stock prices. However, I am in the camp that we will see not only bond prices fall (yields rise) but stocks prices will fall as well, at the same time. This could easily occur if we have a flight from US capital markets like we did in late 2008. The catalyst could be a downgrade of US credit, which I do believe is coming very soon. 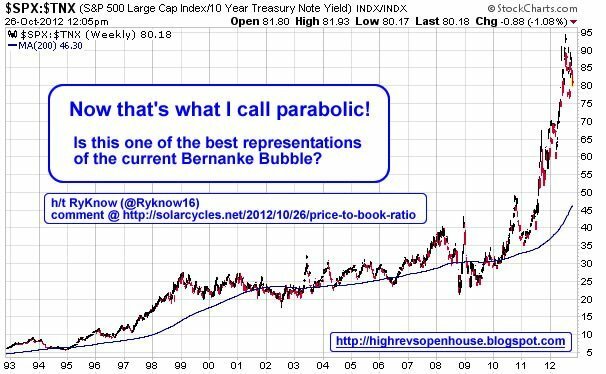 The uncanny growth of stock prices and bond prices, like every other chart that has formed a bubble like price pattern, will have to correct. 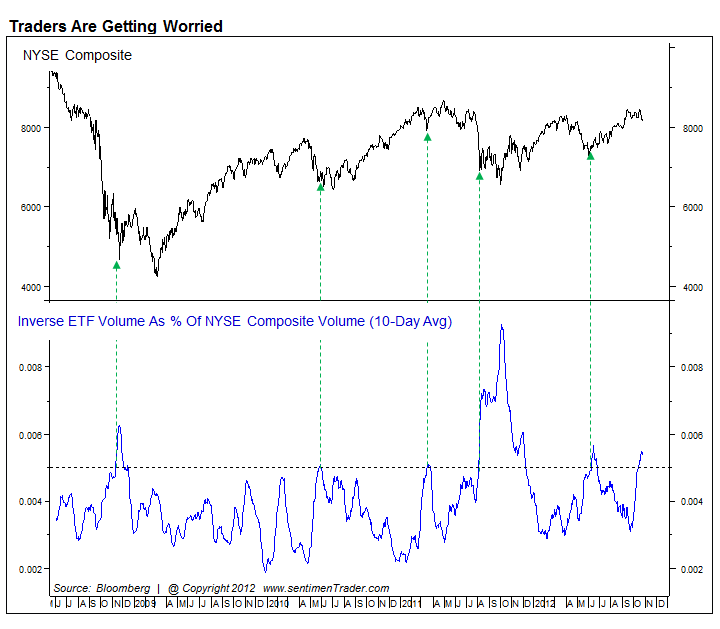 The chart now shows we could be in for just that very soon and we have at least one catalyst that has taken affect – weak corporate earnings and guidance. In the near term (six months) I am looks for the ratio to, at minimum, return to 400. This could mean the S&P 500 at 800 and 10y yield at 2%. But more likely I believe we will see the S&P return to 1200 and the yield rise to 3% in that time frame. By the way, a few months ago I listed a few charts that were in bubble-like price patterns much like this ratio is. It looks like some are cracking (or have already): $SHW, $TJX, $MNST, $DLTR,, $ROST just to name a few. Sorry, in the first paragraph I meant 790. Not 79. Thanks Highrev. I appreciate it. Have a great trip John. Stay safe. Will sure miss your detailed awesome updates. The Yen historically weakness substantially if and when interest rates by the Fed / Treasury market rise (or any other CB). Reason? Capital chases higher yield abroad. Currently, Japanese household wealth held aboard is relative to 55% of Japans GDP. Japan is about to overtake China as the largest holder of Treasuries. Now, let me ask another question? What happens to the Yen when Fed keeps rates at zero and continues to ease further and further with QE? Well return on assets abroad stops being attractive and capital is repatriated back home. Capital flows ALWAYS move the currency market meaningfully and anyone who has read George’s Soros book titled Alchemy of Finance would understand that in-depth. That is what has already been happening as the world has entered a ZIRP environment (Zero Percent Interest Rate Policy). That is why the Yen has been so strong. Now… every few months some “guru” that doesn’t understand anything I just wrote in the first few paragraphs, comes along and tries to short the Yen since 2009 bottom and gets embarrassingly burned. As I just finished my weekend readings, I have noticed that just about every “guru” be it from UBS technical newsletter, to Danske Bank, Nordea Bank, Merrill Lynch etc etc is once again forecasting the top for the Yen with some overly-predicatable head and shoulders pattern or an Elliot Wave 5 wave bull market top. The question is: what fundamental conditions do we need to see for the Yen to top? Inflation in the developed world will have to get out of control and the Fed will have to be forced into cancelling all QE programs and start mopping up excess reserves followed by increasing rates. Now, that is very unlikely, especially if we enter a recession in 2013/14 as I am predicting. I’ve argued that after a 4 year expansion, business cycle is just about done. For Fed to turn hawkish we need to see employment rising and credit growth accelerating. Does anyone else find this funny, apart from me? I mean, honestly, this is just wishful thinking. The economy has experienced trillions of dollars of unprecedented stimulus and it is barley growing. We are at stall speed and the figures themselves are fudged. For god sake, why are we even discussing the probabilities of Fed turning hawkish? In my opinion, the Fed will continue to be dovish and as a matter of fact, it will even turn on the printing presses further into easing territory of uncharted waters. As some of you know, Chris Puplava explained how G7 needs to roll over 5 trillion of debt by 2015. What about US unfunded liabilities? There are trillions and trillions there. Who… apart from Central Banks will buy this debt? Hahahaha it will be total disaster! Fundamentally the Fed will push the Yen higher regardless of overvaluation. The end of the bull market for the Yen comes when repatriation of capital stops, as global economies finally recover and start tightening rates. With Europe in a recession (and only getting worse) and US and Japan on the edge, things will get worse, before we see any recovery. I personally find the “hopes” of economic recovery funny as the chances of a recession are now highly precipitous. It is only a matter of when and not if. All of these data points traders constantly quote, like this GDP figure or that Industrial Production number.. all of that will be revised downwards when the election finishes. Trusting any government data or believing that central bankers can create a recovery is sure to send an investor broke. Hi John, I love you, I want to know your email address, this is my email address: qiluyongxin@Yahoo.com.CN I want to learn your thoughts, very good. ‘Travel well’ – as they say in SA. Your eyes are open and you will see a lot! We will all be facinated by your impressions of a world in some socio-economic turmoil. PS: Interesting parallel with the ’87 storm that kicked off our stock market ‘crash’ ? I hope not! Hi all, I am here in Singapore just trying to normalise following the time difference change, so a quick summary for now. Now that we are through the full moon and mid-Oct weak seasonality, my expectation is that we can now make a rally in pro-risk into and around the US elections and coming new moon. Supporting that we have seen a series of dojis, or a trend break, in pro-risk over the last few sessions. If that isn’t to mark a change in trend to upwards then it would be a particularly weak bear flag. Combined suggests we may see continued current outperformance equities in Asia versus US, and keeps the global macro picture in the balance. So, looking for an upward trend in pro-risk into and around next week’s US elections (whether that be counter trend or uptrend resumption) and will continue to observe developments for evidence supportive of an equities top (Western equities) or a continued uptrend post consolidation.